I wanted to share this beautiful painting I have just come across with anyone else who has not seen it before- It's by William Barraud (1810-1850) and is entitled 'Dreaming of the Chase- Scottish Deerhounds'. 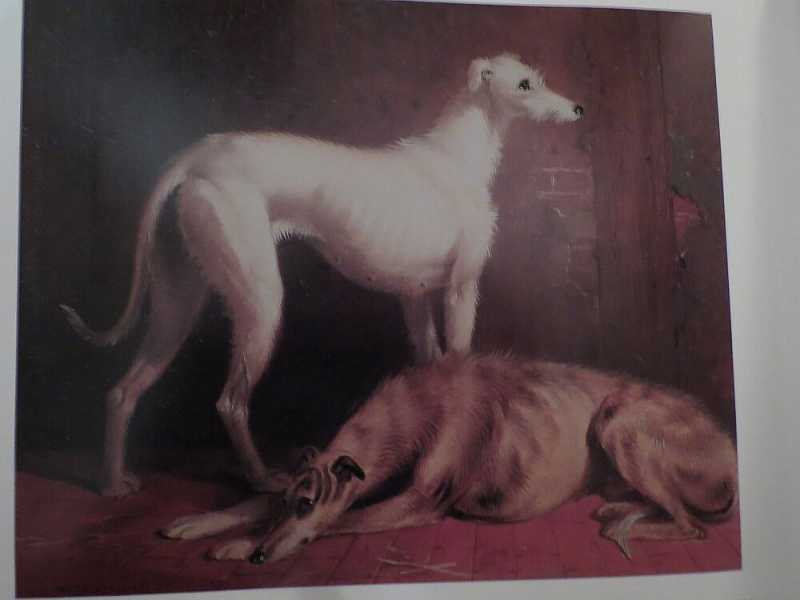 The book says Barraud often painted deerhounds although I have not seen his work before. I love the fact that one of them is pure white and the other a lovely brindle, such a shame and puzzling why these colours have been ruled out by the Kennel Club. 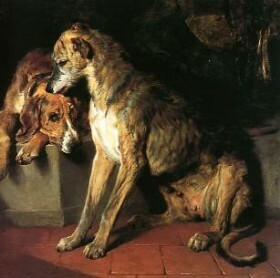 Stunning painting..The one lying down could almost be finn..
"Deerhound and Recumbent Foxhound", a painting by Sir Edwin Henry Landseer's seeing in "The American Kennel Club Museum of the Dog." Not paintings exactly but here's a link to a page of sculptures by Sally Mathews. www.google.ie/search?q=sa...dUvcCFA#imgrc=_ She's a favourite of mine and seems to like deerhounds. She does a lot of work using mud,straw and sticks. Hope you enjoy! Last Edit: 3 years 8 months ago by Hilly. Trowsahound wrote: I wanted to share this beautiful painting I have just come across with anyone else who has not seen it before- It's by William Barraud (1810-1850) and is entitled 'Dreaming of the Chase- Scottish Deerhounds'. The book says Barraud often painted deerhounds although I have not seen his work before. These colours are not ruled out by the Kennel Club, these colours have been lost. The last wheaten deerhound was born in the 1920', he has been bred but he did not give his colour to the puppies. Without mixing with other breeds there will be no deerhounds any more that will not been grey or dark brindle.